I don’t think I have ever described a reading experience as “mind blowing” before reading The 5th Wave by Rick Yancey. But that is exactly how I felt after finishing this novel – mind-blown. I found this book to be utterly terrifying to read; hauntingly lyric and memorable for sure. 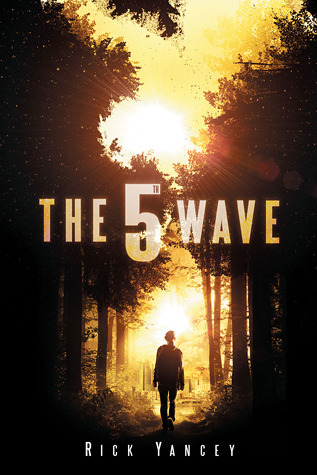 The 5th Wave is narrated by a cast of young adults, namely Cassie, a teen who has – against so many odd – survived four catastrophic waves of alien attacks. She has lost her mother and her father and Cassie is terrified that she may have also lost her little brother. The second narrator is the object of Cassie’s long-time affection, Ben Parrish. The third, Cassie’s hunter, and the fourth, Cassie’s little brother. Each narrator shares his or her story in an individual and distinct voice tinged with fear, doubt, and hopelessness. I haven’t read any other work by Rick Yancey, and I was enthralled by his scenes and characters and writing style. The topic of alien invasion isn’t a new one in fiction, but Yancey turns the topic from science fiction to a mind-bending horror story that is all too logical for comfort. Whether you believe in aliens or not, The 5th Wave will plant the seeds of possibility (and fear of that possibility) in your mind. It’s a thrilling, exciting, and frightening story that I could not put down – and I am eagerly awaiting the next book! I don’t even know if I can read it. Like, ever. I’m terrified, yo. As well you should be!!!! !